Pink dogwood, or Cornus florida “Rubra,” is one of many flowering dogwood varieties. Native to Eastern North America, pink dogwood grows best in U.S. Department of Agriculture hardiness zones 5 to 9. These trees are often planted in these regions as a backyard ornamental because of the showy, pink bracts that appear in the spring. However, the tiny yellowish-green blossom that is found in the middle of four petal-like bracts is the actual flower. 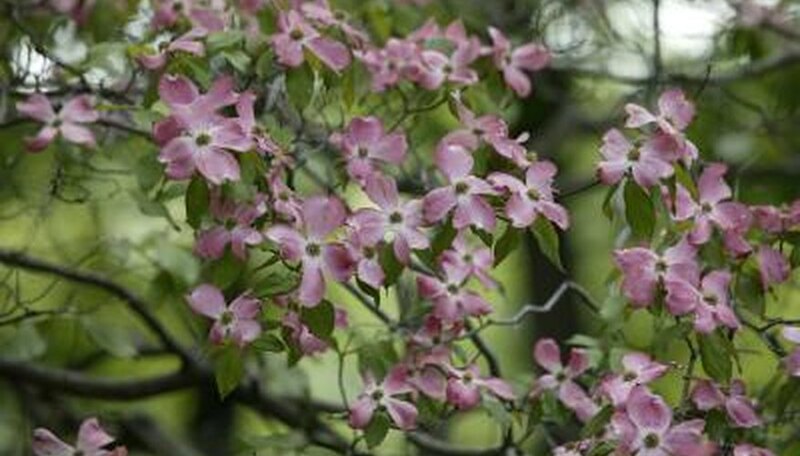 Plant pink dogwood trees in locations with full-sun to partial shade and rich, well drained soil. Choose a site with afternoon shade when possible and room for the mature tree, which typically grows about 25 feet high and has a spread of the same size. Support newly planted pink dogwood trees with stakes or guys for the first year when planted in windy or high-traffic areas. Check the supports often and adjust as needed to prevent damage to the tree in any way. Water the pink dogwood tree well after planting to settle the roots in place. Water the tree one or two times weekly until the end of fall to allow the roots to establish. Slowly water the tree over a long period to soak the soil to a depth lower that the roots. Do not water during the winter or in the following seasons except during extremely dry periods. Add a layer of mulch 3 to 4 inches thick around the base of the pink dogwood tree. Keep the mulch 3 to 6 inches away from the dogwood’s trunk and extend it 3 feet or the diameter of the tree’s canopy. Replenish the mulch yearly to maintain the depth. Do not fertilize pink dogwood trees until the second season and always apply fertilizer as instructed on the label. Use fertilizer, such as 12-4-8, once in February and again in June annually thereafter. Prune pink dogwoods only as needed to maintain a healthy tree. Remove any damaged, frail or crossing branches. Trim off any suckers emerging from the dogwood’s trunk and cut into healthy sections below any diseased parts of branches. Most dogwood trees require little pruning and any major pruning to remove large branches is best done in the winter.